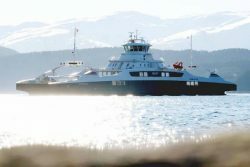 MAN Cryo, the wholly owned subsidiary of MAN Energy Solutions, has in close cooperation with Fjord1 and Multi Maritime in Norway developed a marine fuel-gas system for liquefied hydrogen. The system is scalable and adaptable. In 2013, MAN Cryo supplied the world’s first bunker vessel, the SeaGas, with operations in Stockholm, Sweden. The design for the conversion of the SeaGas was also provided by Multi Maritime with whom MAN Cryo has a long-time cooperation.